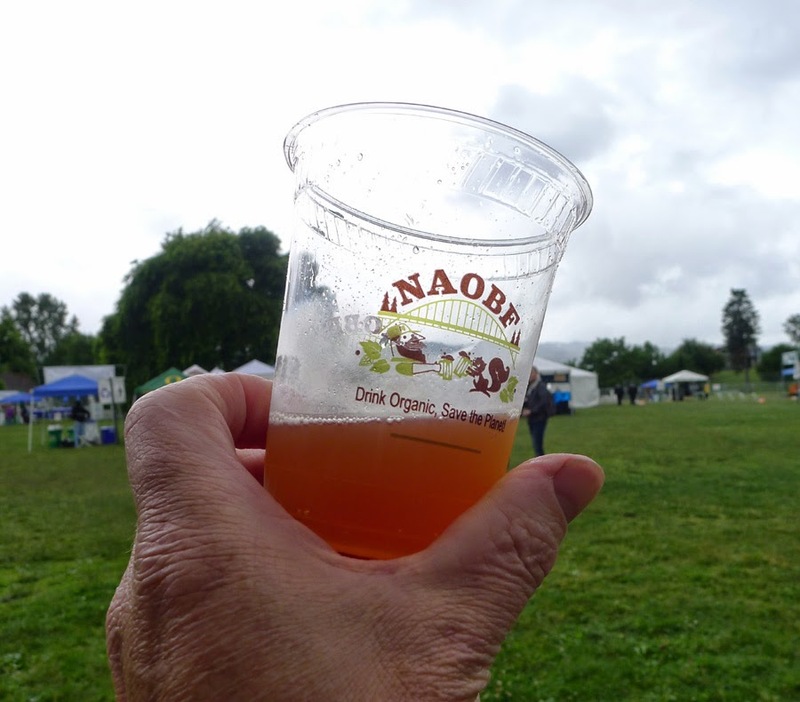 If you attend enough summer beer festivals in Oregon, sooner or later you're going to get wet. 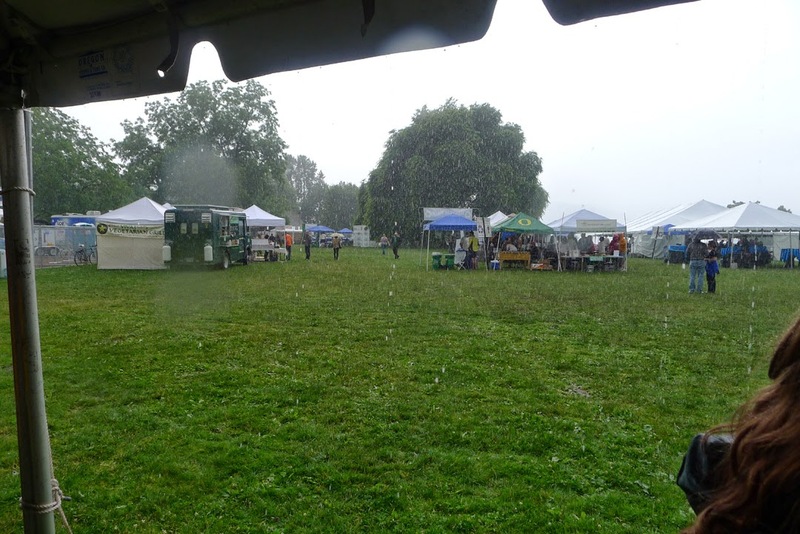 Such was the case for opening day of the 2014 North American Organic Beer Festival at Overlook Park. The rain simply refused to go away. Those in attendance were not deterred. As I was saying to some friends as we worked our way through beers and homemade bread-sticks, getting a little wet at a summer festival is something you have to experience. I could have postponed my visit to the weekend, when the weather is expected to be better. But I wanted to experience the event in the rain. Call me crazy. The crowd was small on Thursday. The event expanded to four days last year and I suspect it would have been fairly busy by late afternoon had it not been for the weather. Beer fans usually pick up on an additional day by the second or third year. For anyone worried about the rain, there are plenty of places to hide. When the rain started coming down heavier at one point, virtually everyone hanging around near the beer taps moved under cover. Pretty funny. There's also a large tent with tables and chairs where they have several flat screen TVs showing soccer or whatever. It's a nice arrangement. The big shade tree that lives just beyond the entry gate is back in action. 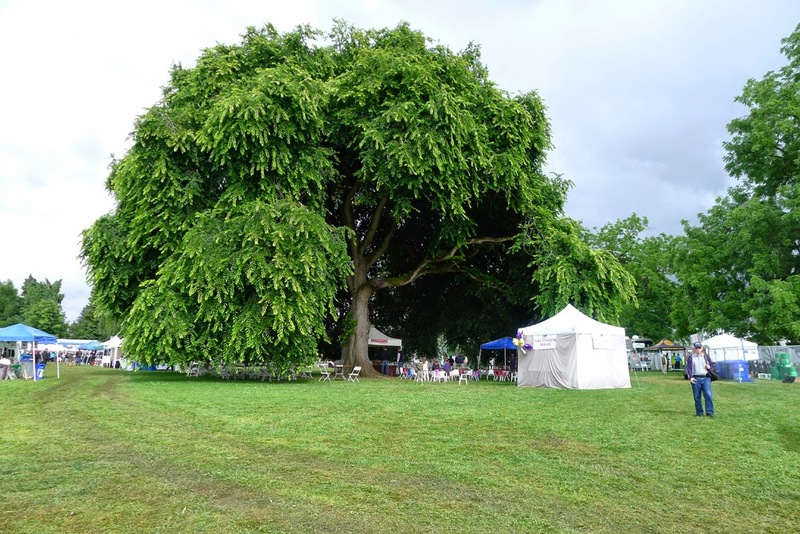 Last year, you may recall, the area under the tree had to be abandoned during hot weather due to a cracked limb. It's pretty plain to see where that amputated limb once grew. There are plenty of good beers to be had. From my brief cheat-sheet, the Ambacht G++ was excellent, just as it was last year. I reckon it was worth the double token price. Hopworks Totally Radler tasted great even on a cool, damp day. I had targeted Pints Bio-Liner Weisse, but it was not present, and may not be for the duration due to some sort of mix-up. I settled for their Green Line Pale Ale, a light and crisp little mistress. There were many more. One thing you need to be aware of is they have gone to a 3 ounce taste this year. It had been 4 ounces in the past and the press materials said that would be the case this year. Not so. 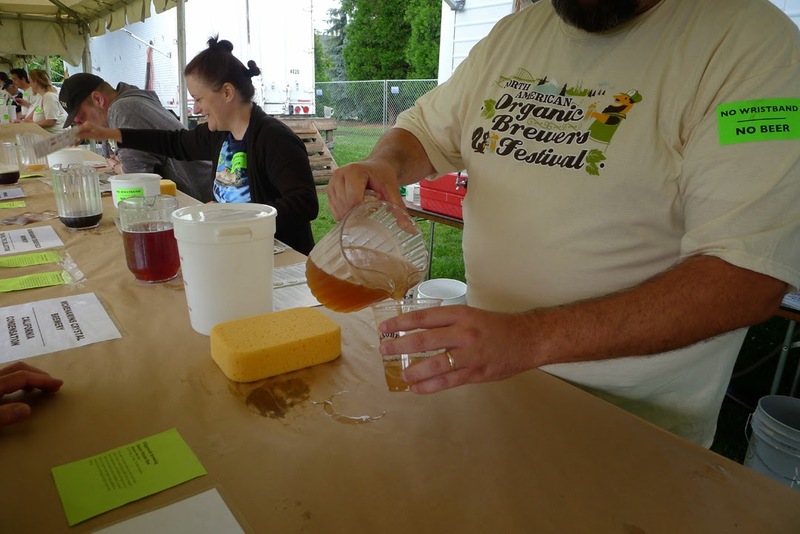 They appear to be following the lead of the Oregon Brewers Festival and others with the change. There's not much you can do about it, but I do suggest avoiding the double token beers. At one token, you are paying the equivalent of $4 for a 12 oz beer. At two tokens, you're paying $8 for that same beer. It's a little steep. Looking ahead, I suspect this is the last year the NAOBF will be held in June. They've simply had it with the unpredictable weather. Last year they had cool followed by hot. This year, rain. It gets a little old hoping and praying for good weather and getting mixed results. And we all know Oregon weather tends to be better and more predictable after the Fourth of July. Next year's event will likely move into July and may change venues, as well. Nothing is certain, yet. Look, it's great to have an event that allows attendees to get there by public transit or bike. But there's very little parking, which discourages folks who have to come by car. And you really need to make your event easily accessible to all potential comers. As for this year, the forecast had been suggesting the weekend weather would be better than Thursday or Friday. Now it looks a little dicey. I don't really see why that should be a problem for beer fans. As noted, there's plenty of shelter...and what's a little rain, anyway? This is Oregon!